On 15-16 May, an academic conference on 'Connectivity, Trade and Economic Cooperation' was held in Linz. 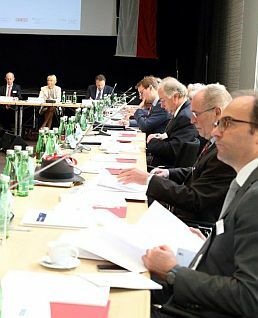 It was co-organised by wiiw and the chairmanship of OSCE. The conference on 'Connectivity, Trade and Economic Cooperation', already the third in a series of conferences jointly organized by wiiw with the Austrian, German and Swiss Ministries of Foreign Affairs in the framework of their OSCE engagements, dealt with a very ambitious vision - to promote economic cooperation for a space combining North America, Europe, Russia and Central Asia. It may seem quite unrealistic to promote the vision of a common economic space on such a scale at a time when there is substantial uncertainty about the future economic and political course of the US; when relations between Europe and Russia are at their lowest point since the cold war; when there are numerous unresolved conflicts and and a time of increasing protectionism and nationalism worldwide. Several discussants called into question the very possibility to even address economc issues at a time when major political differences and conflicts remain unresolved - some frozen and almost forgotten and other still ongoing. And, there was a related question: if economic connectivity should be employed, to what extent are current attempts to reduce barriers, e.g. in the form of trade faciliation agreements, actually helpful? Generally, the discussion showed strong support for economic connectivity as a useful instrument for conflict prevention. 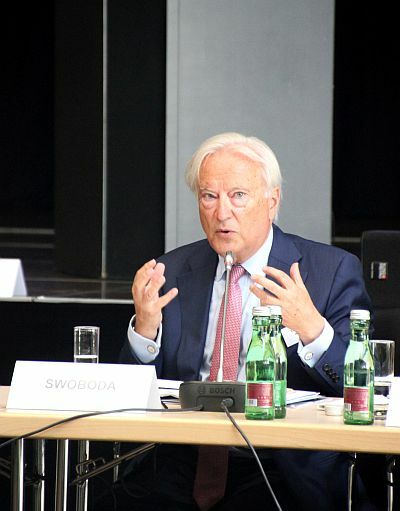 Hannes Swoboda, President of wiiw, put it like this: 'Conflicts have never been solved by cutting links. Solutions are only possible if there are at least some connections between the parties involved that may serve as the basis for finding areas of mutual interest. In the end, there has to be a parallel strategy of solving political conflicts as well as supporting economic connectivity'.